User accounts are one of the important service our team’s website provides to students, but password storage is one of those things you don’t want to mess up. The problem with password storage is that the obvious ways to do it have some huge problems - and we should get it right the first time. In this little article I’m going to take you through a few approaches to password storage, and teach you about some important techniques that we will need to make our system secure. When a user tries to log in, we take their username and their password, and we compare them against what we have in our database. If the password they gave us matches what’s in the database, then the password is correct. This works, but it really isn’t very secure. If anyone ever got access to our database, they would be able to just read all of our user’s passwords and everyone’s information would be compromised. We need a better way. A much better way to store passwords is to “hash” them first. But what’s “hashing”? Now, the important thing about hashing is that it is one-way. It is easy to calculate the hash of some data, but impossible to reverse that process except by brute force. To use hashes in our password system, we can store the hash of the password instead of the password itself. That way, if somebody gets access to our database, they will only have a list of password “fingerprints” - but not the passwords themselves. So how do we check if a user entered the right password? All we have to do is hash the password they gave us before we compare it to the hash in the database. Because hashes are unique, if the hashes match, the passwords match! This is definitely an improvement over just storing the passwords in plain text. If anyone gains access to our database now, they will just have a list of hashes instead of a list of passwords, and each hash can only be cracked by brute force. See how they have the same hash? Because they have the same hash, we can tell that they have the same password - which might mean that they have a common password that’s easy to guess. 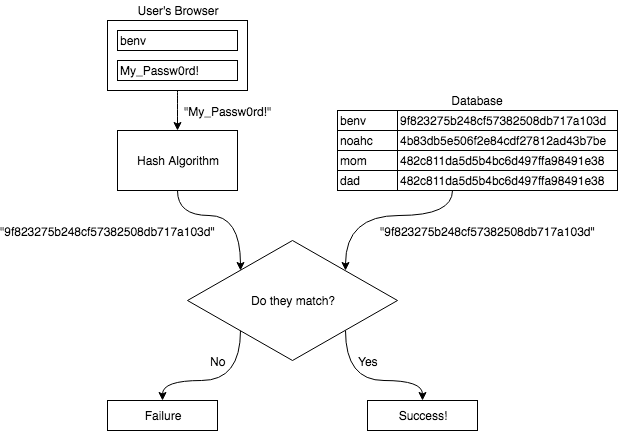 It also means that an attacker can crack multiple passwords in your database by figuring out a single hash. Also, although hashes can only be cracked by brute force, people have spent a lot of time brute-forcing! You can easily download lists of hashes for every common password out there. Using those, if an attacker sees “482c811da5d5b4bc6d497ffa98491e38” in a database, it won’t take them any time to find out that the password is “password123”. We need an even better way. The big problem with hashing alone is that it is too predictable. So what if we add some randomness to it? One of the problems with Approach 2 was that hashes for common passwords are already well-known. So what if before we hash the user’s password, we tack some random data on the end? After all, everybody knows the hash for “password”, but nobody knows the hash for “passwordWOIUHDBMNFBJYASTIUHKJNGKJDHJSDF”. 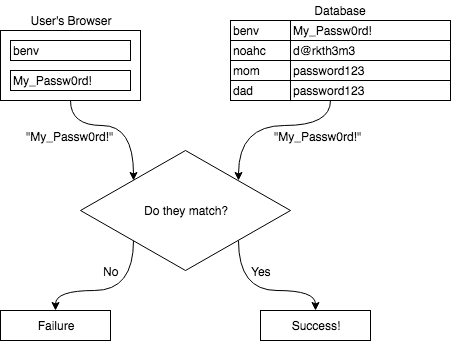 This process of attaching random data is called “salting”, because it adds a unique “flavor” to each password. The random string we use is called the “salt”, and it’s different for each user in our database. First it generates some random string to act as the salt - say, “HFGDZFGHMXGKJYHT”. It appends the salt to the password I provided: “My_Passw0rd!HFGDZFGHMXGKJYHT”. The password is now “salted”. 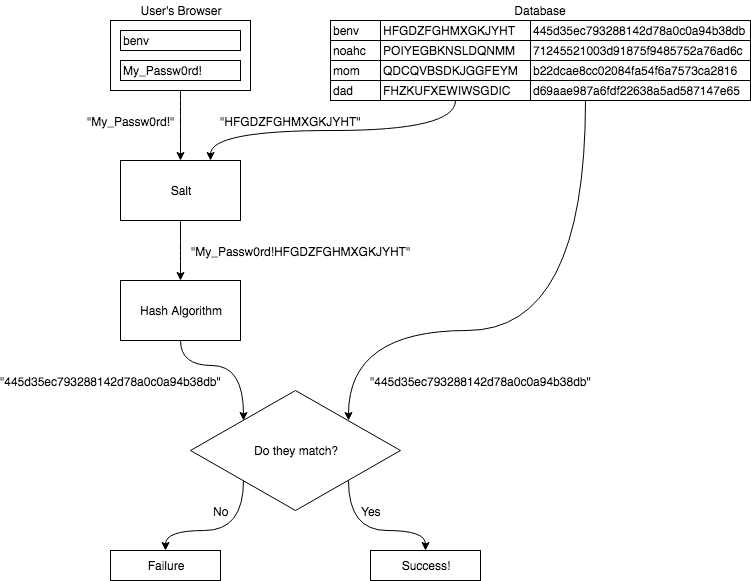 Finally, it hashes the salted password and stores both the salt and the hash in our database. Note that mom and dad have different hashes now! When we use salting, every user in our database should have a different hash, even if they have the same password. Plus, all that random data should make even common passwords much harder to crack. So when we’re using salts, how do we actually check if a user’s password is correct? We modify Approach 2 just a little bit - before we hash the given password, we look up the user’s salt and stick it on the end. Everything else is still the same. Also, it’s important to note that the salt doesn’t have to be secret! All the salt does is make the hashes themselves less predictable. Approach 3 is the most secure of the three, and it’s good enough for us to use. Also, we shouldn’t use MD5 for our hashing algorithm, since it’s actually not very secure at all. Instead we should use bcrypt, which forces the computer to work really hard for each hash. It’s very hard to brute-force a password when it takes half a second to do every single hash! Let me know if you have any questions or need any more examples. Hashes use mathematical operations that are easy to perform but hard to reverse. One example is modular addition - in other words, addition that wraps around at a maximum value. 5 mod 3 = 2, because 5 / 3 = 1, with a remainder of 2. 10 mod 2 = 0, because 10 / 2 = 5, with no remainder. See how the n mod 3 column just repeats “0 1 2” over and over? When you divide by 3, your remainder can never be greater than 2, so it keeps wrapping around to 0 again. Now, let’s invent a really bad hashing algorithm! First, let’s assign a number to each letter of the alphabet. We’ll keep it simple: A is 1, B is 2, C is 3, etc., up to Z is 26. Our hash algorithm will be to add together all the letters of our string, then take that result mod 10. So our final hash is 2. Now, here’s the important question. We know that the hash of a particular string is 7. What is the original string?